Published income statements for the past year, the Russian parliamentarians. 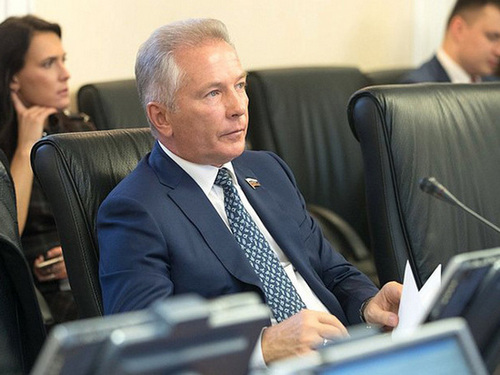 The champion among the State Duma deputies was Grigory Anikeev, representing the Vladimir region, with an income of 2 billion 327 million rubles, among the senators – a representative of the Kamchatka Territory, co-owner of Okeanrybflot, Valery Ponomarev, who earned 2 billion 345 million rubles in 2018. In total, the richest parliamentarians declared revenues of more than 3 billion rubles. Grigory Anikeev has two land plots with free use of 1597 and 600 “squares”, respectively, one land plot is leased (10,901 sq. M.) And three residential buildings measuring 778, 265 and 200 sq. M. The list of Anikeev’s vehicles is amazing. In addition to several cars, fishing boats and a motorcycle, the deputy owns a helicopter, an all-terrain transporter and two medical service vehicles. The latter, likely, Anikeev uses for charitable purposes. The incomes of public person deputies are much more modest. The leader of the Communist Party of the Russian Federation Gennady Zyuganov again received the highest income among the heads of factions of the State Duma – 7 million 927 thousand rubles. In 2017, Zyuganov earned 6.3 million, in 2016, 5.5 million rubles. In joint ownership with his wife, the politician has an apartment (167 sq. M.). There is a cottage (113 “squares”) and a Volkswagen car. The income of LDPR Chairman Vladimir Zhirinovsky in 2018 increased from 5.4 million to 6 million 761 thousand rubles. He owns several land plots for his personal subsidiary farming, 8 residential buildings with an area of ​​31 sq. M. m to 464 square meters. m, pool size 803 “square”, two garages (657 and 600 sq. m.) and one car of domestic production – “Lada”. The head of “Fair Russia” Sergey Mironov earned in 2018 4 million 940 thousand rubles (a half million more than in 2017). In his joint property with his wife apartment of 63 square meters. m. Plus, the leader of the faction is the owner of two cars and a caravan. As for the leader among senators – Valery Ponomarev, in 2017 he came out “only” in second place, earning 1 billion 878 million. As we can see, Ponomarev’s wallet for 2018 became almost twice as thick. His wife last year increased the family budget by 27 million 70 thousand 526 rubles and 61 kopecks. At the disposal of the senator from Kamchatka 3 apartments with a total area of ​​more than 500 square meters, in the use of his wife one more, with an area of ​​175 meters and also in Russia. The senator has 5 car parks, on which Bentley BENTAYGA W 12, Bentley Arnage R, GAZ-21 and Ferrari F430 stand. Judging by the living space, then Kerimov is generally poor as a church mouse, he has apartments of 53.5, 37.8 and 53.5 square meters, and the latter belongs to a minor child of a parliamentarian (I do not invent anything, as stated on the website of the Federation Council ). Suleiman Kerimov drives a Mercedes Benz 600 and Mercedes Benz 600 Maybach, his wife owns three more cars – two BMW 760 Li and one Mercedes Benz 600. Among other members of the upper chamber, traditionally included in the list of “wealthy moles”, is the senator from Karelia Igor Zubarev, who earned 564 million 432 thousand rubles. Compared with the previous reporting period, the parliamentarian’s financial capacity more than doubled – a year earlier, he declared 219 million. The representative of the executive branch of Kamchatka, Boris Nevzorov, in 2018 earned 489 million rubles. A year earlier, his income was 337 million, that is, there was a modest progress, especially in comparison with his wife, whose earnings amounted to 37 million 374 thousand 652 rubles 24 kopecks. The family of the senator “on the right of ownership” has a land area of ​​2500 sq. M. meters “for individual housing construction”, 1850 meters “to accommodate houses of individual residential buildings” and 400 square meters. meters “for agricultural use” (probably, this is a vegetable garden where radishes and sorrel grow). Boris Nevzorov owns two residential houses measuring 139 and 339 square meters. meters, another house belongs to the senator’s companion, his footage – 745 spatial units. Nevzorov’s spouse also owns a 72-meter flat and “ancillary facilities with a bath, boiler room and garage” – 151 meters. The senator drives the BENTLI W 12 car, the senator’s wife prefers the LEXUS LX 570. Alexander Babakov, the envoy of the Tambov region in the upper house, received 373 million 437 thousand 186 rubles 34 kopecks last year. A year earlier, his earnings amounted to 564 million rubles. Babakov shares with his wife a 70-meter Russian apartment; their minor child owns a 250-square-meter dwelling in Belgium. From the income declaration it follows that Babakov “does not have” vehicles. Other senators who own property outside Russia are: Lyubov Glebova (apartment building in Germany), Tatyana Lebedeva (house in Estonia, apartment in Portugal), Dmitry Saveliev (house in Great Britain), Arsen Kanokov, whose minor child lives in the “hostel” all in the same UK. Earnings chairman of the Federation Council Valentina Matvienko amounted to 15 million 274 thousand rubles. Among the property owned by a third party of the state is “the slope adjacent to the plot that is not subject to development” with a size of 2,771 square meters. The arrested senator from Karachay-Cherkessia Rauf Arashukov was not expected to provide a declaration of income. Apparently, this is precisely the reason for depriving him of the powers of a member of the upper chamber.